I completely agree. Being an artist I was skeptic before of anything other than traditional methods,artists are pretty old fashioned after all. However, this class itself has caused me to see the benefits of engaging in different types of learning.Being able to witness how my idea of art could be enhanced by technology is proof enough! Seeing how it was so advantageous to me as a student and future educator, I can only imagine how beneficial it would be to students being introduced to it early on in their education. This was a very interesting article to read. For me, it put into words almost exactly my experience with this class. As someone who was completely new to online classes and using technology with education at this level, I struggled a lot at first in seeing the point of working my way through something that I was sure I would have no need of in the future as a hopeful art teacher. However, the more connections I made between the technology we were using to gain information and achieve a purpose in this class and my subject matter, art, the more I saw the advantageous influence that technology could have in an arts based classroom. By working my way through all these different forms of learning on the computer, and merging them with my knowledge and interest of art has already opened my eyes to my subject matter in a new way. My experience in going through the actual process of this class- the assignments and all they entail- and the knowledge I gain from completing them, have ultimately encouraged me to pursue ways that I can use technology effectively in an art classroom in a combination of ways. 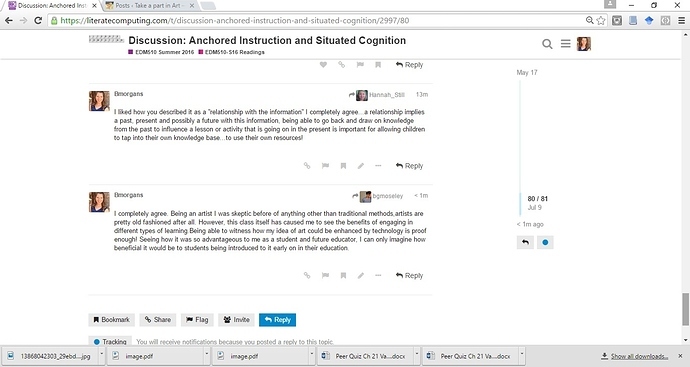 If students in other subject areas are using different formats to get the same information- seeing things from multiple perspectives- then art students should to!’ I particularly like the idea of the “rich mental models” that would come from students participating in instruction in a variety of different formats. Having students participate in a video session, or an online activity, PLUS group discussion or collaboration for one assignment would all create a sort of mental map- or mental model- of all the ways the students are familiar with this information. This would allow them to recall information easily if they needed to in the future, because they would be able to draw from more than one memory of gained knowledge or skill that they have stored away in their brain. I had never heard of anchored instruction before this assignment but apparently I have incorporated it into my class without knowing. I think it can be a very useful strategy though. The idea of anchored instruction seems like it challenges students to think of things in a different way. I teach math so I think anchored instruction is a great strategy to get students to connect things they already know, to new content and it lets them know what to use and when. I think there is a beauty in letting students take more ownership in their learning and anchored instruction gives the students more responsibility during assignments. It seems like a lot of us had never heard of anchored instruction before. I love the things you brought up in your reply about connecting the two subjects. I teach math so sometimes I find it’s harder for me to do that. I try to connect two topics in the way that they mentioned doing the two subjects and it really seems to brighten light bulbs. In my reply I mentioned that it gives students more responsibility in their learning process and that is what you touched on at the end of your response. I loved your response. I completely agree with how you saw the article. I love how you saw this article!! I cannot agree with you more! The idea of giving students skills take with them for life is very underrated in my opinion. Skills that anchored instruction reinforces will provide students with more interactive learning and will give students ‘arsenals’ they can use for life! I completely agree that if you make any subject or lesson plan relevant to students the likelihood of the students retaining the information is higher. Our minds are wired to make connections, and these connections spur more thought and ignite ideas. I agree. When students are introduced to a new level of learning it allows them to become innovative thinkers. I do not like children learning the basics. In real world situations, children can apply skills to life skills from what they have learned in the classroom. The article about anchored instruction is very informative. I think anchored instruction and activities such as those described in the article could be very helpful to students who are kinesthetic learners. These activities allow students to better engage with the information through hands-on learning. Therefore, while anchored instruction is aimed at helping students retain what they learn, I think it can also be used to draw their attention and keep them engaged in the content. I also like the activities/strategies that target two or more content areas at once. I love the idea of anchored instruction. It makes learning meaningful. Anything that allows learning to have a purpose is worth exploring. In the two activities, the students were more engaged with the anchored instruction compared to the basic basal readings. Instead of making minimal connections to story elements, the students were able to include majority of story elements. Furthermore, research is evident in a class when you use anchored instruction. 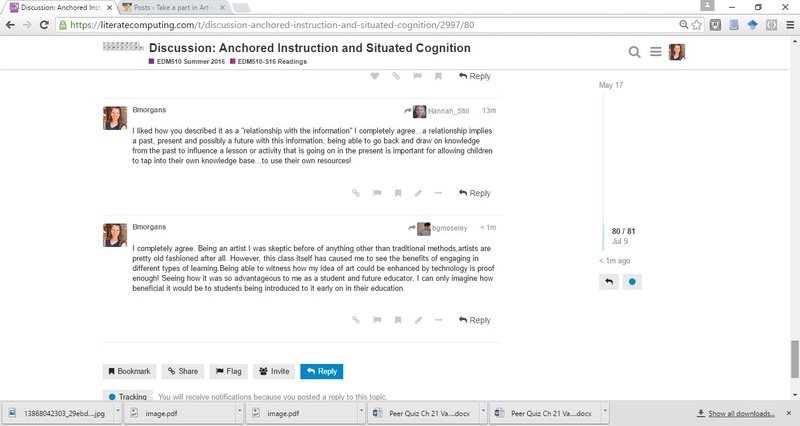 I will definitely explore anchored instruction more. This will be a great addition to my class instruction. Enriched meaningful discussion will evident in a class that implements the use of of anchored instruction. Have you heard of Flocubalry? If not, I HIGHLY recommend you check out the videos they offer. Really good stuff. My 8th graders last year loved the videos. @jandry Yes I love it. It is a great resource for my third grade babies. @cturner Can you tell me a little more about the learning style quiz? I would love to use that as part of my instruction plan as well. I agree with anchored instruction with the respect to use visual contexts. From previous experiences, students learn better with visuals and hands on approaches. I believe students should still engage in reading, but also pair videodisc with their assignments to enhance their learning. Using videodisc rather than videotapes also shows how far technology has advanced and should be implemented into the classrooms. From reading the article, I learned that students who are low achieving students are able to form mental models of the problem situations. Ideas in reference to anchored instruction are still being formulated that will guide the selection or production of anchors and the types of teaching activities that will be associated with the anchors. @akelley I agree with your points made to this article, especially where you mentioned student engagement…this millennial generation certainly has a much different way of learning in comparison to my generation X. As noted in this article student learning has to be engaging and must come with a diverse methods of instruction.